When I saw the fluffy eggless Lemon Yogurt Pancakes with Lemon Drizzle shared by Zoe Bake for Happy Kids, I know I must make some ! Cos my kind of pancakes too :) With her "hints here & hints there" given, to make these yummy pancakes is pretty easy! Thanks to Zoe for her sharing. I've forgo making the lemon drizzle since I've some homemade Blackberry Chia Jam in the fridge. Some vegetable cooking oil for cooking. 1) Lightly whisk and combine the dry ingredients (B) in a large bowl, and make a well in centre. 2) In another smaller bowl or jug, whisk wet ingredients (A) till combined and pour to (B) and mix until smooth and combined. 3) Heat the non-stick griddle or pan with low flame. Dap a little cooking oil with kitchen towel and lightly grease onto the non-stick griddle or pan. 4) Spoon 2 tablespoonful of batter onto the heated pan. Flip gently with a spatula, cook about 2 minutes or till golden brown on both sides. I can't wait to enjoy these immediately .... spread with homemade chia jam and some blueberries I could find in the fridge. Yummy ! These pancakes tasted awesome .... slightly crispy on their edges and moist and soft inside :) Enjoy ! 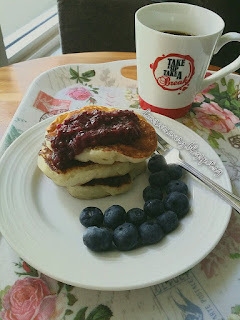 I love eggless pancakes too as it's easier to just scale the quantities to make for one person! Love your blueberry chia jam, looks so good! Thanks Jasline. Yeah I love pancakes anytime ! Zoe shares so many amazing recipes, Karen. 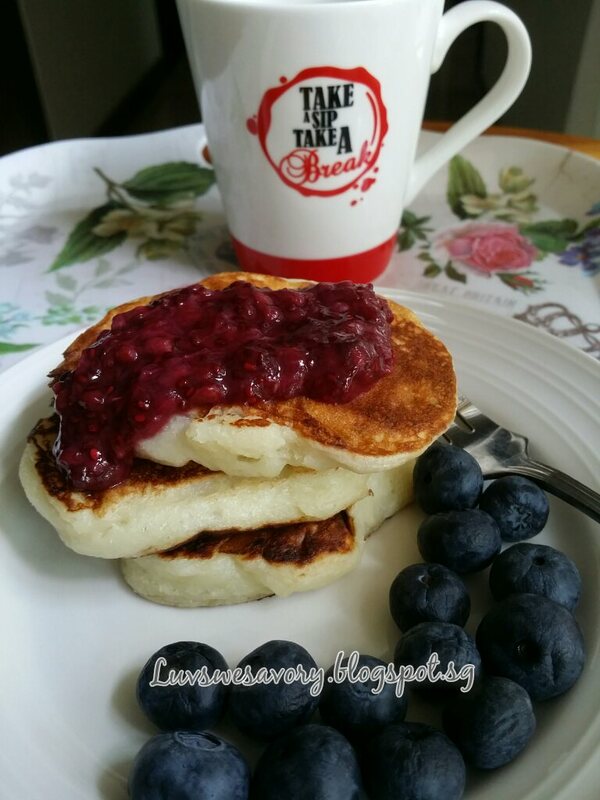 I don't know how I missed this one, lol...I'm always happy to find an eggless dish that I can actually enjoy, lol...These Pancakes look perfect and, I just made fresh yogurt too. I sure wish I had some of your Blackberry Chia Jam. From fb, I see this scrumptious eggless pancake, make me droolinglah! Thanks to your great sharing, Zoe ^-^! Karen I can see that your pancakes and thick and fluffy. Delicious!! 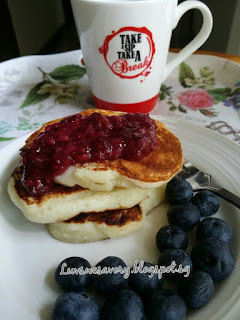 The pancakes look very good and yummy with the jam. Have a happy weekend! Thanks Nancy, you too have a great week ahead! Hi Karen, these pancakes are a big winner in my book, my family would love these. Perfect week-end breakfast. Yummy pancakes in love that combination but never thought I could use it in pancakes as well.